In my new book Nationalist Responses to the Crises in Europe: old and new hatreds I explore the emergence of populist nationalism in contemporary Europe. Drawing on multi-sited fieldwork carried out in 2015 in England, Hungary and Norway amongst the voters and supporters of the United Kingdom Independence Party (UKIP), Fidesz and Jobbik, and the Progress Party, I examine the emerging resistance towards migrants and diversity. The rise and appeal of populist nationalism must be analyzed in relation to the increasing economic, culture and political competition linked to globalization. These affect countries and regions unevenly. But in all, the insecurities and societal ruptures associated with rapid, accelerated change have enabled the heating of populist nationalisms in local struggles over resources and recognition. In Norway, characterized by prosperity and a robust welfare state, the anti-immigration discourses propagated by the neoliberal Progress Party focused on cultural accounts of difference rather than on economic grievance. In Hungary and England, resistance towards immigration did unite the voters, but in addition discourses of economic insecurity and the uncertainty of work were also propagated by Eurosceptic PRR parties and their supporters. While the divide between cultural and economic insecurity has value when applied to macro contexts, I challenge it´s applicability at the level of everyday life. Through an anthropological in-depth study of local lifeworlds I show how cultural identity cannot be separated from economic conditions. In 2015 I did ethnographic fieldwork in the post-industrial, working-class town of Doncaster, where UKIP obtained its electoral breakthrough. In the 1980s, a mining life gave rise to a particular kind of identity and pride in the very insecurities associated with industrial work and the community, not just in the mines, but more generally. With the closing of the coal mines, the Doncastrians I met associated a sense of painful loss, of feeling, identity, meaning and community. Their common working experiences in the past were key in shaping their culture and in constituting a sense of dignity and recognition. Particularly my interlocutors from the older generation, compared life today with the life they experienced before the decline started three decades ago. They expressed anxieties over being made redundant in a precarious labour market. They were anxious about the fast processes of change that they felt had affected their town and lives largely negatively. They were anxious about the speed of demographic change, and about the impact of European integration and migration on their welfare, jobs and way of life. In Doncaster, the figure marked out as ‘the threatening other’ was that of the Polish migrant looking for work, who, they claimed, stole jobs and resources rightfully belonging to British nationals. They did not distinguish between cultural and economic grievances, in short. However, they felt strongly that their grievances and uncertainties were ignored by Labour and the political establishment. While the local material and cultural specificities for the heating of populist nationalism might be very local, there are clear common themes that emerge in their proposed solutions. The populist nationalists offer economic and cultural protectionism against ideas, forces and people considered threatening to an imagined “us”. The parties claim to provide better futures modelled around a romanticized past and “good old days”. They pledge to reinforce territorial boundaries, to stand up for morally virtuous “little people” against the elites, and to protect them against others often defined in religious or racial terms. While the populist nationalist parties vary in legacy, ideology and orientation, they converge in their grammars of exclusion. The stylistic repertoire of radical right parties, as expressed both online and offline, continue to use age-old rhetoric and social imaginaries of ethno-religious difference. Historically, Jews and Roma have faced racist tropes and persecution. In present day Europe, the figure of the migrant Muslim stranger is used in political mobilisation, partly as a way of projecting the pure insiders by contrast – ie. those who rightfully belong to the nation. 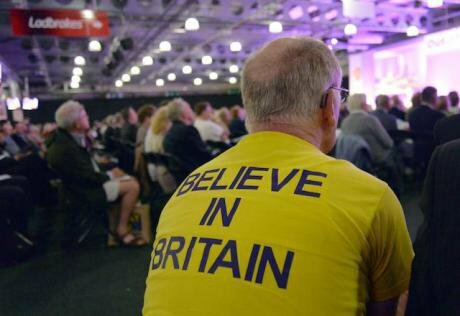 While local supporters of UKIP primarily expressed concern about the impact of European integration upon their jobs, welfare and way of life, the party was quick to translate these grievances into a politics of fear, demarcating Muslim migrants as ethno-religious threats to ‘our’ imagined sameness. The racialization of convenient scapegoats proved a powerful formula for supporters who already felt battered by forces outside their control. In particular the so-called refugee crisis in 2015 in combination with jihadi terrorist attacks in Europe provided a structural opportunity for radical right actors who could present themselves as protectors of endangered nations. In state campaigns propagated by the increasingly authoritarian Viktor Orbán, asylum seekers from Muslim majority lands were framed as existential threats to the white nation and Christian civilization. Old antisemitic tropes, talking of Soros’ wealth and power, were fused together with Islamophobic warnings that the Jews want to Islamise Europe. Such conspiratorial thinking about a Jewish masterplan to take over Christian European with uncontrolled migration from Muslim lands illustrates how antisemitism and Islamophobia are reconfigured by globalization, with the explicit purpose of reinforcing the racialised boundaries of the nation. The surge in support for PRR parties poses increasingly strong challenges to political establishments across Europe and North America. PRR parties have demonstrated that they now can win key electoral battles. Authoritarian populists in power are already dismantling the checks and balances of democracy. In Hungary, the governing PRR parties who openly embrace ethnic nationalism pose a challenge to liberal democracy and the conventions, freedoms and values that sustain it. Orbán is praised in other countries in the region, in particular in Poland where the leader of PiS- the Law and Justice Party-Jaroslaw Kaczynski has hailed the illiberal democracy as a model state. Another worrying effect of the electoral gains of the radical right is that conventional parties can draw their policy agenda and rhetoric further to the right in the intensified competition over volatile voters. The grievances that have enabled the rise of populist nationalism – a sense of cultural dislocation and feelings of relative economic deprivation are likely to persist. The increased salience of accelerated migration, the growing public anxiety over the role and perceived integration of Muslim communities, and dissatisfaction with the mainstream parties and European institutions will continue to cultivate opportunities for the populist radical right. Europe is experiencing increasing stress as it struggles to find unified solutions to the crises of migration, the economy and security. Mainstream politicians need to better address the concerns of the citizens who feel left behind or unrepresented by conventional parties. At the same time, they need to challenge conspiratorial thinking and myths about migrants and minorities. Conventional parties, rather than adopting the divisive rhetoric and slogans of PRR parties, should challenge them on their policy proposals. If conventional parties fail to seize the opportunity to reconnect with disillusioned voters, the radical right will surely continue to do so.